SS.13 Lady is the most technically advanced, short sleeve ASSOS cycling jersey for women. The front panels are constructed from ASSOS superlight fabric, which wicks moisture away from your body, and keeps you cool in warm temperatures. The back panel features our patented ASSOS exoskeleton platform, which works as a rear panel stabilizer, to provide you with superior fit when in the riding position and stops the jersey shifting when your pockets are full. 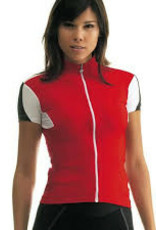 Wear a base layer underneath your SS.13 Lady Jersey to keep your skin dry and comfortable.